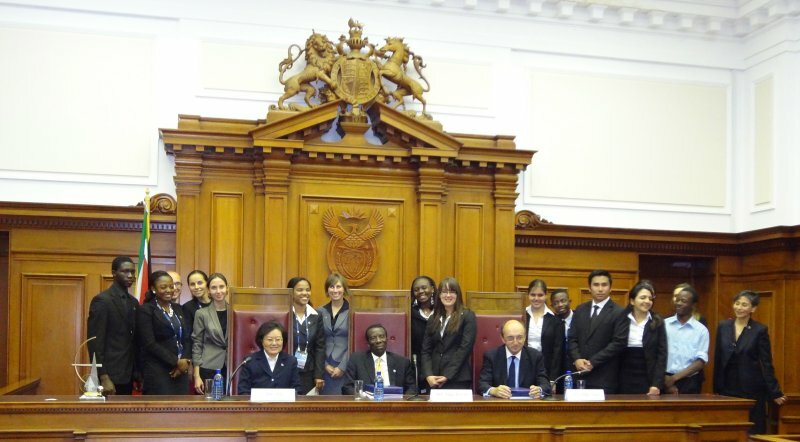 The winning 2011 moot court team (Credits: International Institute Space Law). What happens if a satellite’s orbit degrades and it re-enters the atmosphere, crashing to Earth and causing significant damage to someone’s property? Who will pay if an accident happens on a suborbital spaceflight? Space activities are inherently risky, and when space activities go wrong, loss of property and even loss of life may result. The inherent risk of space activities requires the establishment of rules. Since 1967, five treaties with legal binding force and several guidelines have been created to regulate space activities. However, questions and uncertainties exist at the edge of these regulations and may need further attention. Since 1992, the International Institute of Space Law has organized the Manfred Lachs Moot Court Competition to further a deeper understanding of space law and to explore unsettled questions about the legal aspects of space activities. The IISL’s annual student competition is based on a hypothetical space law dispute before the International Court of Justice. The competition was named posthumously for Manfred Lachs, who served as a judge of the ICJ in The Hague, The Netherlands, and was directly involved in the drafting of the space treaties. During the competition, students argue by citing legal sources like the 1967 Outer Space Treaty, a fundamental source of international space law, which gives States the impetus to regulate and license space activities, mandates that space be used for peaceful purposes, and prohibits claims of ownership on the Moon or other celestial bodies. Subsequent space treaties like the Astronaut Rescue Agreement, the Liability Convention, the Registration Convention, and the Moon Agreement are also cited and used to advance the advocate’s claims, along with general principles and sources of public international law, resolutions related to outer space from the United Nations General Assembly, the State practice of various nations, and the writings of legal experts. The Problem of this year’s Lachs Moot Court is entitled “Case concerning On-orbit Collision, Non-cooperative Satellite Removal, and Damages.” The competition is already well underway – the participant students have submitted their written arguments and will meet this Spring in regional rounds in Europe, North America, the Asian-Pacific, and in a new African round, to plead their arguments in front of several panels of judges. The winners of each region will then meet in the World Finals in conjunction with the annual IISL Colloquium on the Law of Outer Space and the International Astronautical Congress, held this year in Naples, Italy. Traditionally, the IISL has been honored by having three Judges from the International Court of Justice. Last year, the finals were decided by Judges Xue Hanqin, Abdul Koroma, and Peter Tomka.